Readings selected from The Princeton Encyclopedia of Classical Sites (eds. Richard Stillwell, William L. MacDonald, Marian Holland McAllister), 1976. The remains of the ancient town on the Vardar (ancient Axius) river in a suburban community ca. 5 km NW of modern Skopje in Macedonia. Excavations have revealed a large but not well-preserved Roman theater and a public bath. An episcopal basilica nearby, the cemetery basilica, and a large building near the theater have also been excavated. Sections of the city wall have been exposed in recent years and a large cemetery of the Early Roman period has been excavated. The Archaeological Museum of Skopje, the largest in Macedonia, contains finds not only from Scupi but from numerous other sites, including Stobi and Demir Kapija. F. Papazoglu, Makedonski Gradovi u Rimsko Doba (1957) 24, 46, 87, 132, 205. The site lies along the left bank of the Crna (Erigon) river where it empties into the Vardar (Axius) ca. 160 km N-NW of ThessaIonica. It occupied the juncture of two of the most important ancient routes in the Balkans: the corridor of the Vardar was the chief route between the middle Danubian regions and the Mediterranean, and a road from the Via Egnatia at Heraclea Lyncestis passed through Stobi and continued NE into Moesia. The cut for the modern highway from Athens to Belgrade and the railway for the Orient Express passes through the NE limits of the ancient city. 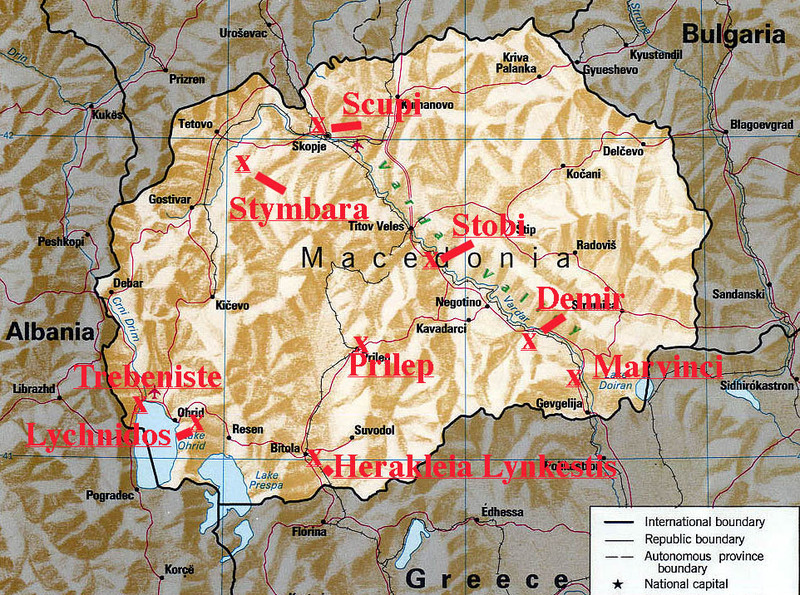 Livy (39.53.16) referred to Stobi, and the town figured prominently in his account of the N campaigns of Philip V of Macedonia in the 2d c. B.C. Stobi became a municipium during the early Roman Empire and minted its own coins at least from the reign of Titus to that of Elagabulus (69-222). The city continued to flourish during the later empire and may even have become the capital of the province of Macedonia Salutaris in the late 4th c., and even later of Macedonia Secunda. Theodosius I resided briefly in the city and issued two edicts. Stobi was an especially flourishing community during the 5th c. when Johannes Stobaeus resided there and a number of palatial structures, public and private, were erected or remodeled and lavishly decorated. The grandeur of its Episcopal Basilica and related buildings, along with the presence of at least four other basilicas, indicates its importance as a wealthy ecclesiastical center. The historian Malchus records that Stobi was sacked in 479 by the Gothic army of Theodoric. There is considerable evidence of rebuilding at the site, but the city seems never again to have recovered its former prosperity. It ceased to exist as an urban community before the end of the 6th century. Most of the monuments revealed by excavations belong to the 4th-6th c. and lie on the S slope of the low ridge that projects into the angle of the two rivers. The fortified area of the town measures ca. 450 by 450 m and the line of the city wall, exposed in a few places, can be followed for most of its extent. Part of a Turkish pavement is preserved above the city wall near the center of its E line and leads to the ruins of a bridge across the Crna. The N basilica (5th-6th c.) lies at the NE end of the lower excavated street and is distinguished by the presence of a small quatrefoil baptistery with a sunken cruciform piscina attached on its N side. The next building to the SW is a civil basilica and beyond that a large complex that included, in the 3d c., the residence of Polycharmus and the Jewish synagogue. A second synagogue with a mosaic floor and frescoed walls was superposed on the first and was followed in the next century by a Christian basilica at a still higher level. Mosaics with both animal and geometric motives are preserved in the adjoining residence to the SW and a small bath lies to the E. Structures dating to the 2d c. B.C. lie below the civil basilica and the synagogue where a hoard of some 500 silver Roman denarii was found in 1971. Beyond a cross street is a large bath, partly restored, in which were found a number of late Roman portrait statues. Large private residences occupy the next two blocks to the SW including one with a colonnaded court and fountain adorned with Hellenistic and Roman bronze and marble statues. These latter large complexes fill the area between the upper and lower of two roughly parallel streets. Farther to the SW along the upper street is another large residence on the right and opposite it the spacious residence of the bishops of Stobi. The street is paved with flagstones and lined on both sides by colonnades for the remaining 100 m or so to the Porta Heraclea, the only gate yet excavated. A semicircular, colonnaded court stands at the N end of this main street opposite the entrance to the two-storied basilica of the Bishop Philip, whose name is preserved in the dedication inscribed on the lintel of the entrance to the nave. The basilica in the 5th c. was decorated with figured frescos and elaborate mosaics, partly preserved in the narthex and S aisle. The carved marble screens of the ambo and the presbyterium, along with numerous figured capitals of fine workmanship were found in the earlier excavations and are in the National Museum of Belgrade. The three aisles of the naos were increased to five in the late 5th or early 6th c. by the addition of mullioned screens in the side aisles. A vaulted crypt lies below the S wall and there is a sunken confessio in the apse. An earlier building with well-preserved wall frescos bearing geometric motives has been found below the S aisle. The floor of this earlier structure, perhaps a church, lies some 4 m below the earlier of the two superposed mosaics in the S aisle of the Episcopal Basilica. A broad sandstone stairway led from the narthex to the area S of the basilica where the episcopal baptistery was located nearly 5 m below the floor of the basilica. The baptistery, uncovered in recent excavations, is basically quatrefoil in plan with corner apses, all set within a quadrangle, ca. 9.4 m square. The walls were covered with fresco, of which thousands of fragments were found, including many depicting human faces. The floor is a well-preserved and colorful mosaic of animals in paradise. A circular pool (interior diameter 2.4 m) is centered in the room and set off from it by a low parapet. The pool was revetted with marble and slate slabs and covered by a baldacchino. A marble kantharos nearly 1 m high and 60 cm in diameter was set into the parapet. Many of the marble architectural pieces used in the Episcopal Basilica and elsewhere in Stobi during the 4th to 6th c. were originally part of the 2d c. theater that lies immediately E of the basilica. The cavea was built in two tiers of gray-white marble from nearby Pletvar and could hold over 7600 spectators. The scena frons was built of rose and green breccia and fine white marbles. Rubble screen walls and parapets and a sanctuary of Nemesis point to its later use as an arena. Nearly half of the lower tier, both paradoi, and much of the scene building are still in place. The seats bear hundreds of inscriptions listing the names of patrons. A small building NE of the theater seems to have been devoted to entertainment and pleasure in the last years of Stobi: its rooms included an apsidal gaming room and a room with marble-encrusted bathing cubicles. A cemetery (1st to early 4th c.) has been partly excavated just outside the Porta Heraclea. A Christian basilica with adjoining cemetery is located ca. 300 m SW of the gate; another basilica, ca. 1000 m farther SW, was cleared near the bridge to the village of Palikura. Large and elaborately decorated structures have recently (1972-74) been explored below the flood plain of the Crna river. The Casa Romana on the banks of the river E of the Synagogue has walls decorated with molded stucco panels and pilasters as well as colorful frescos. A yet larger structure lying below the 4th c. Inner City wall has mosaic floors and marble-encrusted walls with arched niches preserved to a hzight of over 4 m. Both buildings were in use in the 2d and 3rd c. and may have been built still earlier. There is a small museum at the site where some of the recent discoveries may be seen. Material from the excavations in the 1920s and 1930s is in the National Museum in Belgrade and a few items, mainly inscriptions, are in the Archaeological Museum of Skopje. R. Egger, "Die stadtische Kirche von Stobi," JOAI 24 (1929); B. Saria, "Neue Funde in der Bischofskirche von Stobi," JOAI 28 (1933) 132-33; id., "Pozoris�te u Stobima," Godis�njak Muzeja Juz�ne Srbije 1 (1937)PI (shortened German version, "Das Theater von Stobi," AA  81-148); D. Mano-Zissi, "Mosaiken in Stobi," BIABulg 10 (1936)I; E. Kitzinger, "A Survey of the Early Christian Town of Stobi," DOP 3 (1946) 81-161; E. Dyggve, "La the�tre mixte du bas-empire d'apr�s le the�tre de Stobi et les diptyques consulaires," RA (1958) 1, pp. 137-57 and 2, pp. 20-39; R. E. Hoddinott, Early Byzantine Churches in Macedonia and Southern Serbia (1963)PI; J. Wiseman & D. Mano-Zissi, "Excavations at Stobi, 1970," AJA 75 (1971)PI; id., "Excavations at Stobi, 1971," AJA 76 (1972)MPI; id., "Excavations at Stobi, 1972," AJA 77 (1973) 391-403MPI; id., "Excavations at Stobi, 1973-1974," JFA 1 (1974)MPI; id. (eds. ), Studies in the Antiquities of Stobi I (1973) and II (1974)MPI; J. Wiseman, Stobi. A Guide to the Excavations (1973)MPI. DEMIR KAPIJA Republic of Macedonia. The name, meaning Iron Gates, is applied to the narrow pass through which the Vardar (ancient Axius) flows, ca. 24 km S of Stobi in Macedonia. High, sheer cliffs rise above the Vardar at this point and there is a small town, also called Demir Kapija, just NW of the cliffs near the modern highway. Stenai, mentioned by Strabo (8.329.4) and other ancient writers, may have been located here. Fortifications and house walls of the pre-Greek settlement have been found near the narrows above the right bank of the river; and walls, perhaps of a watch station, are known on the cliffs above the left bank. Near the former area, but lower along the river terrace, several graves containing Greek vessels of the 5th and 4th c. B.C. have been excavated. The Roman and Early Christian community was a few km farther to the SW along the Bos�ava river where a small Christian basilica (probably 6th c.) has been excavated. A number of graves of the 4th to 6th c., as well as burials of the mediaeval period, were excavated in the vicinity. Earlier Roman funeral monuments were also found near the basilica. F. Papazoglu, Makedonski gradovi u rimsko doba (1957); B. Aleksova, Demir Kapija (1966). A large city in the middle of the Pelagonian plain showing Greek form and influence (triangular plan, ca. 550 x 220 m). It lay on the river Erigon (now the Vardar) and the road from Stobi to Herakleia Lynkou, near the present-day village of C�epigovo. Its origins go back to the late archaic period, and it was continually inhabited from then until late antiquity. Still visible are the city walls and the excavated gymnasium. Strabo mentions the city, as does Livy, who tells us that in 200 B.C. the Roman army fighting Philip V turned to the N from Lynkos (Herakleia) and came to Stubera, where it could get wheat. Further on he mentions the city as the Macedonian base during Perseus' struggle with the Illyrians in 169. Stymbara is also mentioned in the work by the Ravenna Geographer (4.9.2). From the many inscriptions it is to be concluded that it belonged to the circumscription of Deuriopos, that it was included in the tribus Scaptia, and that the conventus civium Romanorum was to be found in it. The lists of city epheboi for the years 190, 203, 206, and 223 survive, enabling us to calculate that in the 2d c. the city had some 20,000 free inhabitants. A few marble statues are of artistic worth. The base is extant for the statue of Septimius Silvanus Nichomachus, member of a family which produced a few Macedonarchs and a consul. The city may have been destroyed in an earthquake. The name has been applied to a necropolis near Lake Ochrid in Macedonia where a number of graves were found to contain burial gifts of remarkable intrinsic and artistic value. The necropolis is in the environs of Gorenci near the village of Trebeniste on the road from Ohrid to Kic�evo. The site was discovered in 1918, and the treasures of seven graves were removed by Bulgarian soldiers to Sofia, where they can now be seen in the National Museum. Some of the more recent discoveries are in the National Museum of Ohrid and the rest are in the National Museum in Belgrade. Fourteen of the graves contained hundreds of gold, silver, and bronze vessels and jewelry, many of which had been imported from Greece along with a number of terracotta vessels decorated in Attic black-figure style. The Greek objects, which include large bronze tripods and kraters adorned with human and mythical figures, date to the second half of the 6th c. B.C., but the many Illyrian objects that accompanied them show that the burials took place only in the second half of the 5th c. B.C. Among the artifacts of special magnificence are a gold death mask, chased silver cups, and bronze Illyrian helmets. B. Filow, Die archa�sche Nekropole von Trebenischte am Ochrida-See (1927); L. Popovic�, Katalog Nalaza iz Nekropole kod Trebenis�ta (1956). LYCHNIDOS (Ochrid) Republic of Macedonia. An Illyrian city at the NE end of Lake Ochrid in Macedonia. It first appears in history in Polybios' accounts of the wars between Rome and Macedonia. It was the W terminus in Macedonia of the Via Egnatia, one of the most important highways in the Roman Empire. The town was part of the province of Macedonia until the organization of the province of Epeiros under Diocletian and it became a part of Illyricum during the reign of Theodosius. The city was sacked in 479 by Theodoric and the Goths and was devastated by an earthquake in 514. It was represented by bishops at numerous ecclesiastical conferences in the 4th to 6th c.
Part of the ancient theater has been revealed near the E wall of the mediaeval citadel and parts of two Early Christian churches have been found, one of them below the Church of Saint Sophia. The mediaeval and modern town lies directly above the ancient site. The National Museum in Ochrid houses inscriptions, sculpture, and a variety of burial gifts from both early and late Roman graves found in the vicinity. Some of the more recent discoveries from the nearby necropolis of Trebeniita are also in the museum. V. Lahtov, Problem Trebenis�ke Kulture (1965)MPI. A town in Macedonia ca. 42 km NE of Bitola (Heraclea Lyncestis). It lies in the NE corner of the rich Pelagonian plain in the ancient district of Denniopus and at the entrance to the Pletvar pass that leads to Paeonia. There are several ancient sites in the immediate vicinity including one at Markov Grad, a suburb of Prilep. A large Roman necropolis is known there and parts of numerous walls have been found; the settlement was probably the ancient Ceramiae mentioned in the Peutinger Table. Roman remains are also known in the vicinity of the Varos� monastery, built on the steep slopes of the hill, which was later occupied by a Slavic and mediaeval community. A large number of early Roman funeral monuments, some with sculpted reliefs of the deceased or of the Thracian Rider and other inscribed monuments of an official nature, are in the courtyard of the church below the S slope of Varos�. Some of the larger of those monuments were built into the walls of the church. There has been only limited excavation within the limits of Prilep and most of this has been concerned either with the later Slavic community, various chance discoveries, or with the necropolis. The burial gifts found in the graves indicate a flourishing community throughout the Imperial period. The small objects are in the National Museum at Prilep and include a large number of early Roman glass vessels, numerous bronze statuettes of Mercury, and an interesting sequence of pottery types. The monastery of Treskavec, in the mountains ca. 10 km N of Prilep, is probably the site of the early Roman town of Kolobaise�. The site, at the edge of a small upland plain, is at a height of over 1100 m above sea level and is a natural citadel. The name of the early town is recorded on a long inscription on stone which deals with a local cult of Ephesian Artemis. The inscription was reused as a base for a cross on top of one of the church domes. Other inscriptions at Treskavec include several 1st c. Roman dedications to Apollo. The necropolis of the town is to the SW of the monastery where the remains of a chamber tomb and a sculpted and inscribed marble funeral monument (1st to 2d c.) can be seen. An important site in the vicinity is Bela Crkva, some 6 km W of Styberra, where the Hellenistic town of Alkomenai was probably located. It is on the Erigon river. Rebuilt in the Early Roman period, it was a stronghold of the Macedonian kings, perhaps from the time of Alexander the Great, and was at the Pelagonian entrance to a pass leading to Illynia. Part of the city wall, a gate, and a few buildings of the Roman period were uncovered here in excavations. All recent finds from these sites are in the museum at Prilep. N. Vulic�, Spomenik 77 (1934) 58; F. Papazoglu, Makedonski gradovi u rimsko doba (1957); I. Mikulc�ic�, Pelagonija (1966). HERAKLEIA LYNKESTIS (Bitola) Republic of Macedonia. At the W edge of the modern city lies the ancient one, founded by Philip V, probably after one of his early campaigns against the Illyrians either in 359-58 or 356 B.C. It was situated on a low hill at the juncture of two ancient routes, one leading from the Adriatic coast through Lychnidos to Thrace, and a second extending NE through Pelagonia to Stobi in the Vardar valley. The former route became the Via Egnatia after 148 B.C. This location on important highways made Herakleia strategically important, and it became the principal town and administrative center of the district of Lynkestis, a fertile plain surrounded by wooded mountains. Herakleia figured in the campaigns of Julius Caesar during the civil wars as a supply depot, and inscriptions of veterans who settled there date as early as the turn of the era. Although the town is seldom mentioned in ancient literature its importance during the Early Empire is attested by numerous private and official inscriptions. The names of bishops from Herakleia are known from the 4th, 5th, and 6th c. The town was sacked by Theodoric in 472 and, despite a large gift to him from the bishop of the city, again in 479. Herakleia was restored in the late 5th and early 6th c. and conquered by the Slavs in the late 6th c.
Excavations have revealed several sections of the fortification wall on the acropolis and two basilicas in the main part of the settlement below to the S. Both basilicas had well-preserved mosaics of the 5th to 6th c. B.C., depicting geometric and figured motives. Test trenches, dug in the vicinity of the basilicas, revealed streets and parts of buildings of the 4th-5th c.
Part of the ancient theater on the slopes of the acropolis has been excavated, but work has been concentrated in the larger of the two basilicas found earlier and in the area to its W and S. The smaller basilica and a small baptistery have been partially restored as well as some sections of the earlier buildings. Mosaics were found in numerous buildings near the large basilica but the most interesting of the new mosaics, remarkable for its size and arrangement, was found in the narthex of the large basilica. It is a rectangle (over 21 x 4.7 m) with a broad rectangular border containing 36 octagonal panels in which fish and water birds are depicted; the panels are linked by intricate meanders. The mosaic dates to the late 5th-early 6th c.
There is a small museum at the site and a large museum in Bitola. F. Papazoglu et al., H�racl�e I (1961); Heraklea II (1965); G. Tomasevic� & M. Medic�, Heraklea III: The Mosaic in the Large Basilica (1967); Tomas�evic� & Tome Janakijevski, Herakleja Linkestis (1973). MARVINCI ("Idomenae") Republic of Macedonia. A village on the left bank of the Vardar ca. 25 km N of Gevgelia. The site of ancient Idomenae probably is on the ridge Isar Kale in its territory. Excavations there in 1961 revealed the marble front (9.7 m wide) of an Ionic prostyle temple dedicated by the Macedoniarch in A.D. 181, according to an inscription on the fallen epistyle. A gate and part of the Roman city wall were cleared NE of the temple. Much pottery and two sculpted reliefs of the late Hellenistic period were also found. B. Dragojevic�-Josifovska, "Rapport sur les fouilles pr�s du village de Marvinci," Ziva Antika 19 (1967) 307-49. The remains of an important city of the Early Christian period near the village of Caric�in Grad, ca. 30 km SW of Leskovac in S Serbia. The city occupies a long, high ridge in a fertile, hilly district and was founded early in the reign of Justinian. The city walls cover an area over 500 m N-S and ca. 215 m E-W. There are additional fortifications around the inner acropolis near the NW limit of the city and another E-W wall with a gate separates the N and lower S areas of the community. There is a circular forum near the N end of the city and paved, colonnaded streets extend from it in four directions; the one to the E leads directly to a large gate through the city wall and the W street enters the acropolis. On the acropolis is a large basilica of two stories with a ground plan that includes a nave with two side aisles and three apses at the E. There is a complex of building N of the basilica and a large, quatrefoil baptistery with a cruciform piscina on the S.
There were at least five other churches in the ancient city, all dating to the 6th c. Of special interest is a long basilica in the S area which has a tripartite transept and a colonnaded atrium. Mosaics on the floor of the narthex and in the naos are well-preserved and depict in large panels scenes of the Good Shepherd, hunters and savage beasts, centaurs, and amazons. The excavators point to analogies for the style and symbolism to mosaics in the imperial palace in Constantinople and to mosaics in Nikopolis. The architectural decoration of the basilica suggests a date of 525-50. An unusual martyrium is located in the NE quarter of the city where most of the shops and industrial works may be found. The martyrium is a three-aisled basilica with an apse. The crypt, like the basilica above, has three aisles, all vaulted, extending the whole length of the church. Another smaller basilica with a nave separated from the two side aisles by arcades is S of the acropolis. Outside the central gate on the E is a large bath with a hypocaust and an apodeuterium that is triconchial in plan. Another church lies to the S which has apses on the N and S as well as on the E.
The city was probably Justinia Prima which Justinian founded near his birthplace of Tauresium. Justiniana Prima, earlier thought to have been at Scupi (modern Skopje), was the seat of the archibishop in Dardania and was the principal city in the region during the 6th c. It was destroyed in the late 6th or early 7th c., but archaeological evidence shows that it was revived in the 9th and 10th c.
The principal excavations were conducted from the 1940s to the 1960s. Many of the architectural fragments can be seen at the site; most of the smaller finds are in the museum in Leskovac.